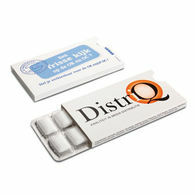 Promotional Chewing Gum is a fresh way to entice new and existing customers. 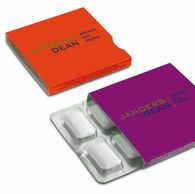 Our chewing gum is available to personalise in a range of packaging and displays. 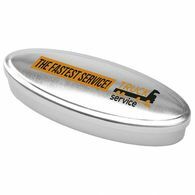 Here at Distinctive Confectionery, we have a range of ways to show off your branded chewing gum, whether you’re looking for an individual pack of chewing gum or want to give your customers more through jars and sleeves, we have a variety of ways to show off your brand. Personalised Chewing Gum is perfect for any industry! Chewing gum can be enjoyed by anyone and most industries can take advantage of a much loved product. 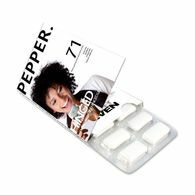 Our range of bespoke chewing gum is brilliant for food industries who want to give back to their customers after a meal, as they're easy to hand out or present on tables. 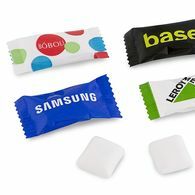 They can be placed on conference tables and handed out at trade shows due to their conveient size and multiple gum options. 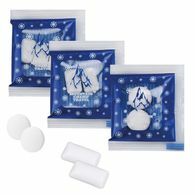 We can also offer sugar free chewing gum, fruit pastilles and sugar free mints as alternatives. 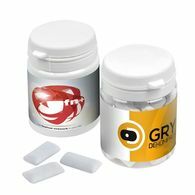 Personalise your corporate chewing gum with your brand logo or message and stand out against the competition. 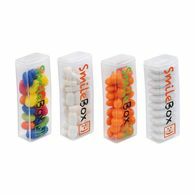 Our personalised chewing gum is kept fresh due to the varieties of packaging options such as blister packs, transparent tubs and chewing gum jars, in which customers and clients can enjoy them and pop them away for later use.